Our Class Re-Action podcast crossed the 5,000 unique downloads mark earlier this month! Sure, it's an arbitrary number. I could get worked up about 4,500 or 5,123, but 5,000 is nice, big round number. It's actually pretty awesome, since I had no idea when I decided to try something whether anyone would listen. All I wanted to do was present information in a different way than the wave of blogging that surged for a while back when this blog started. I was concerned that the signal to noise ratio would become an issue if everyone had a blog. Class Re-Action Podcast: Thanks for listening! 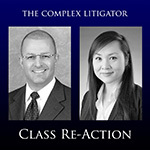 The Class Re-Action Podcast is about to cross over the 5,000 listens milestone. Oh...my...gosh...we all need a life. But seriously, thanks for listening. As a reminder, you can now find the podcast through more services, including the original iTunes, iHeartRadio, Google Play, and Spotify. Hey, Linh, thanks for all the hard work you've contributed to line up absolutely spectacular guests for each show! The Class Re-Action podcast is back in business with new Episode 16, how available anywhere digital technology is! We discuss Alvarado v. Dart Container with attorneys who argued the case before the California Supreme Court. Listen loud! Listen often! I just discovered over the weekend that links to the Class Re-Action podcasts were broken. I fixed the change in the back-end support that caused the problem, and everything appears to be working correctly again. Sorry for the inconvenience. We are up to Episode 15 of the Class Re-Action Podcast, available here. In case you missed the explanation previously, shows will now run between 30 and 45 minutes, due to changes in MCLE requirements. I'm working on blanket provider status so that each show will qualify as MCLE. However, nobody wants reading material as homework, so we are going to stay under an hour an avoid that added complication. Episode 14 of the Class Re-Action podcast is finally up. We recorded the episode a week ago, but a cold did me in right after the show, and I couldn't get a passable intro recorded until today. This episode is our version of the year in review. The guests are Hon. Carl J. West (Ret.) of JAMS and Lynn Frank of Frank & Feder, and we discuss the impact of decisions issued in 2014 on mediation in the class action and complex litigation settings. Episode 13 of the Class Re-Action podcast is now available. Our Episode 13 guest is Andrew Satenberg of Manatt, who predicted a year ago our need to discuss Martinez v. Joe's Crab Shack Holdings (November 10, 2014). Because of the changes to MCLE printed material rules, the Class Re-Action podcasts will now be 30-45 minutes longs, rather than an hour or more. Episode 11 of the Class Re-Action Podcast just went live. Guests Kevin Lilly, of Littler, and Aashish Desai, of the Desai Law Firm provide a lively debate about the impact of Duran v. U.S. Bank National Association, S200923 (May 29, 2014) on class certification and trial. I provide more painful commentary about statistics. Now that the flow of interesting cases is picking back up, we should have no trouble putting together another show next month, even with vacation season season stealing guests away.